The full moon is an excellent time to make moon water. Don't worry if it's cloudy, I made some last night, it was quite cloudy and stormy so I made some wonderful strengthening water. If you can get hold of natural spring water perfect, if not just use tap water, filtered if possible. Fill your container with your water and find somewhere either in your garden or on a windowsill where it will be bathed in moonlight at some point during the night. 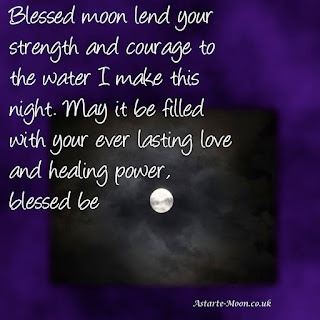 You may like to add a blessing to strengthen your intent such as “Blessed moon lend your strength and courage to the water I make this night. May it be filled with your ever lasting love and healing power, blessed be” If you have a favourite crystal if you add it to the water this will increase the water’s power. If you want the water for emotional healing for example, then adding rose quartz to the water would be perfect. Similarly if you are wanting to use the water for protection then you may like to add a little sea salt to the water which again will increase its natural powers. If possible get up before the sun rises to retrieve your moon water. Pour the moon water into a suitable container to then be used as you require. A thermos flask or a glass container kept in the dark is an ideal container to use. 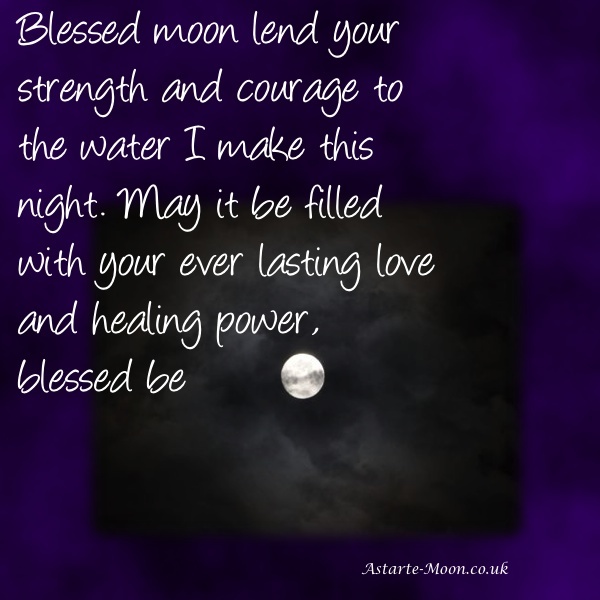 The water can be used in any healing or blessing work that you feel would benefit from the moon’s amazing energy.